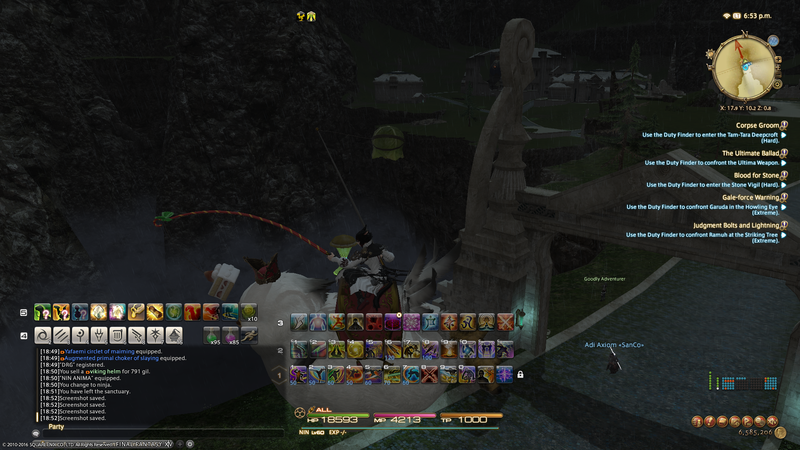 So to give you guys a glimpse of what my hot/action bars look like in FFXIV here you go (yea I took this while flying back to the main city on my white fat chocobo after taking those screenshots). Yes, I pretty much use every single one of those abilities in the middle three bars (the left bars hold other things not pertaining to my job and are shared between all my jobs). Some more then others but for the most part they all get used at some point. Yea we have a lot of buttons to press (my usual rotation is 18 buttons, give or take a few depending on the engagement). Holy crap thats alot of buttons. Do you ever get wrist cramps from doing that rotation all the time? Sometimes but I'm so used to it I don't even notice (and I have my main rotation set-up so I can minimize the movement of my wrists/hands). I'm also a mouse clicker so anything that's not on 1-5 I pretty much click to activate (most people don't even notice I use mouse clicks most of the time as I'm pretty good at it from playing WoW for 6 years) so I can minimize the stress on my wrists. Plus, like I mentioned, the rotation changes depending on the fight. I don't use the full 18 button rotation on trash mobs in instances, that rotation is roughly 10 or so buttons (counting my mudra rotations (mudras are how Ninja's activate their special abilities, they're the Japanese looking buttons on my third bar)). The 18 button rotation is mostly for boss mobs in instances or world bosses from fates where using everyone of my abilities is necessary. I was a mouse clicker for the longest time until I got my logitech g600 mouse. But even with the G-shift function of that mouse there may not be enough buttons on it for all those skills. I'd have to be a clicker on FFXIV too.